The two on the right are CiM dirty martini bases, with a twistie of magic and hades on the rightmost, and MCD and hades on the other, then encased. The magic didn’t strike. 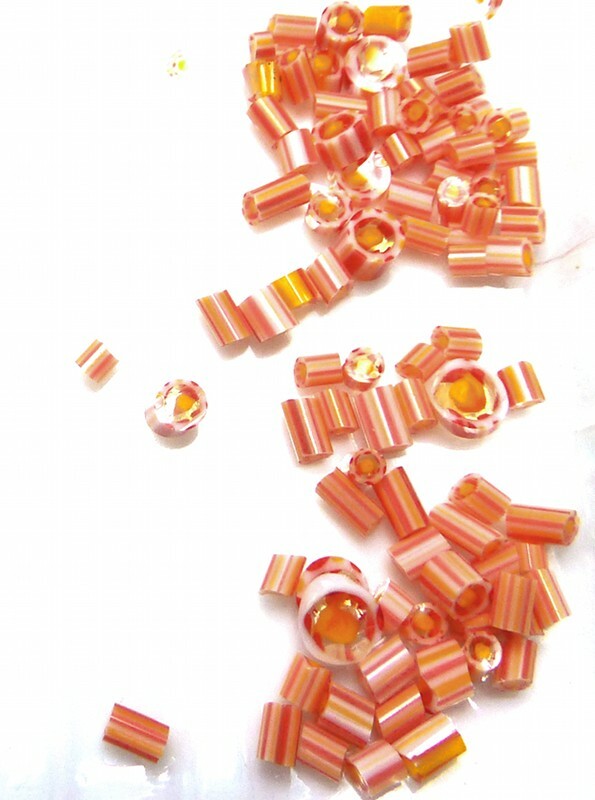 (The MCD developed brighter colour after annealing). The other two are a white latticino twistie wrapped round a black base. This one didn’t work very well, but it does show my rainbow murrini. It is a mid amber lentil with a couple of green twisties on top. I am really pleased with the way this one came out. 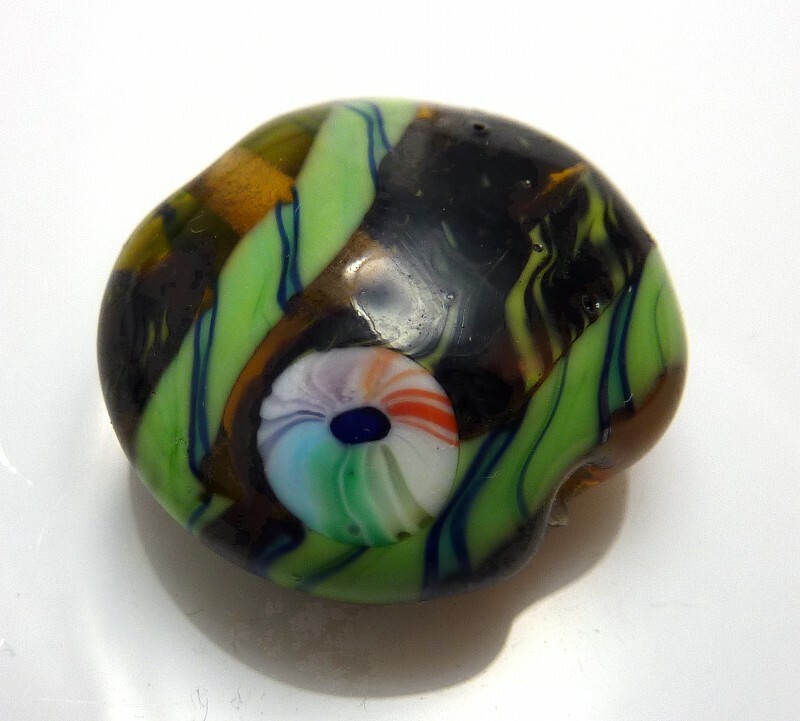 It is a clear core encased in CiM khaki, with Kugler silver green frit that I reduced, then a bit of clear striped over the top, and some of my complex green murrini. I love the way it looks like it has water washing over it. The Theme of the Month Challenge was June Bug this month, so I tried making ladybird murrini. I had to fight a bit with a huge gather, and I now know why people like stainless steel punties for pulling larger amounts of glass. 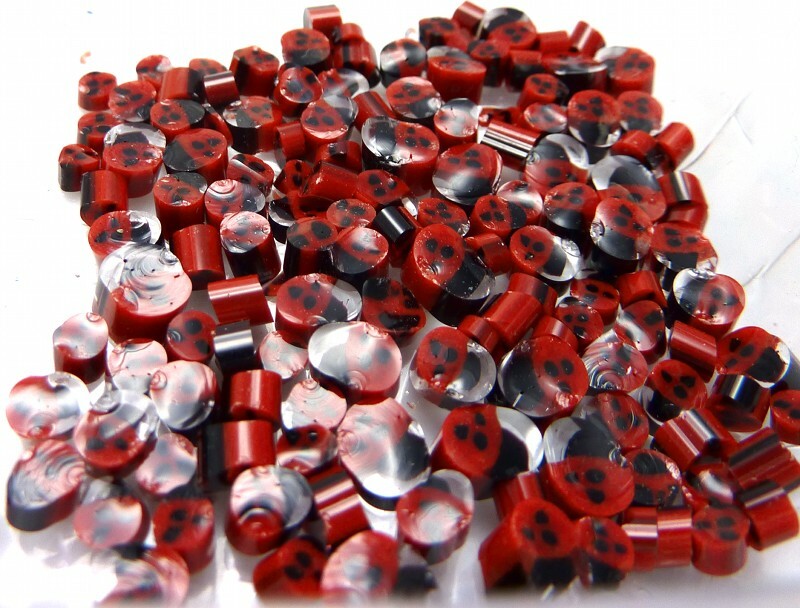 The ends warped, so the ladybirds from there have no heads! 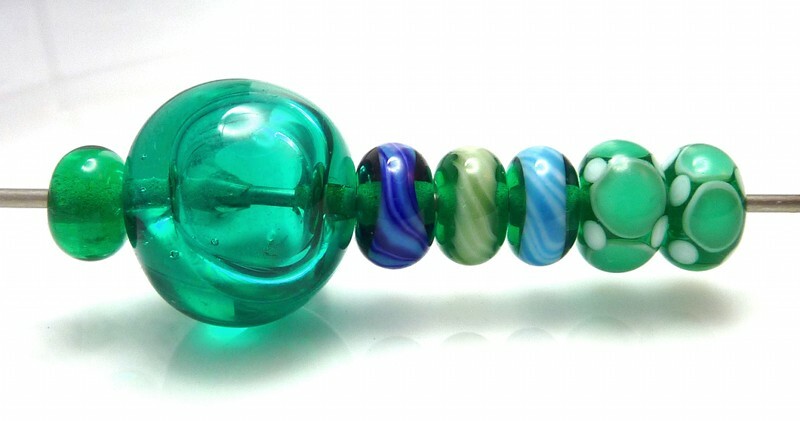 They can be added onto a bead anyway, so they can still be used, but I would rather like some proper punties… (I have had no luck trying to use other glass rods as punties. Something always gets too cold and falls off/shatters exactly when I don’t want it to. I have been pulling my murrini using stainless steel chopsticks, which works well if they’re bullseye-style and you make a relatively small amount at once). And the colour of the month was Effetre 026 teal. 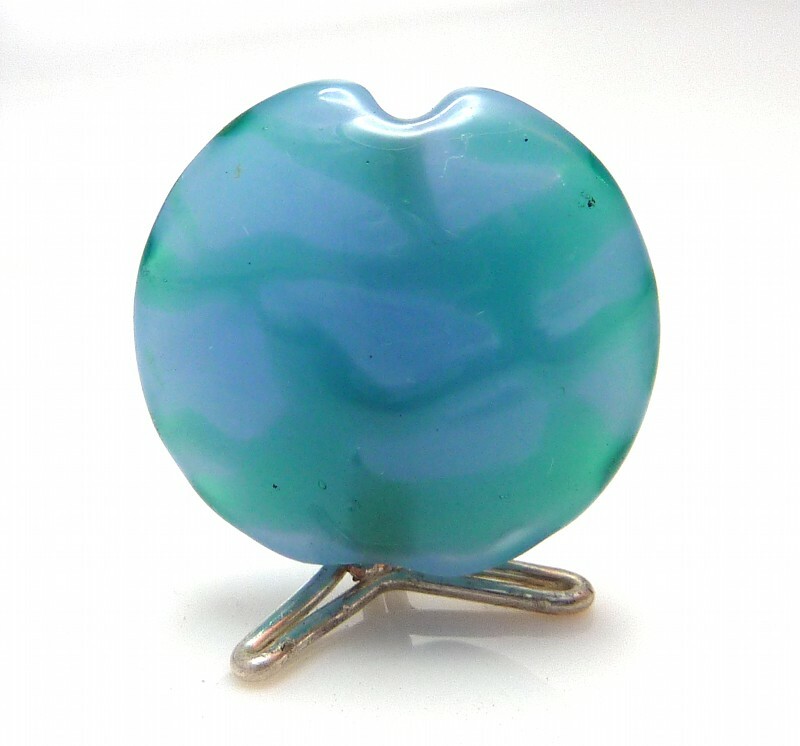 I’ve included in the picture the teal hollow I made a while ago to show the batch variation you can get – it’s much bluer than the (probably older) batch I have more of. There’s a spacer, the hollow, three bases with different twisties wrapped round, and two with teal bases, white dots, more teal on top. This is a periwinkle opalino lentil with trails of teal on top. It has a watery effect (looks better in person – in the photo the periwinkle seems to come more to the front). 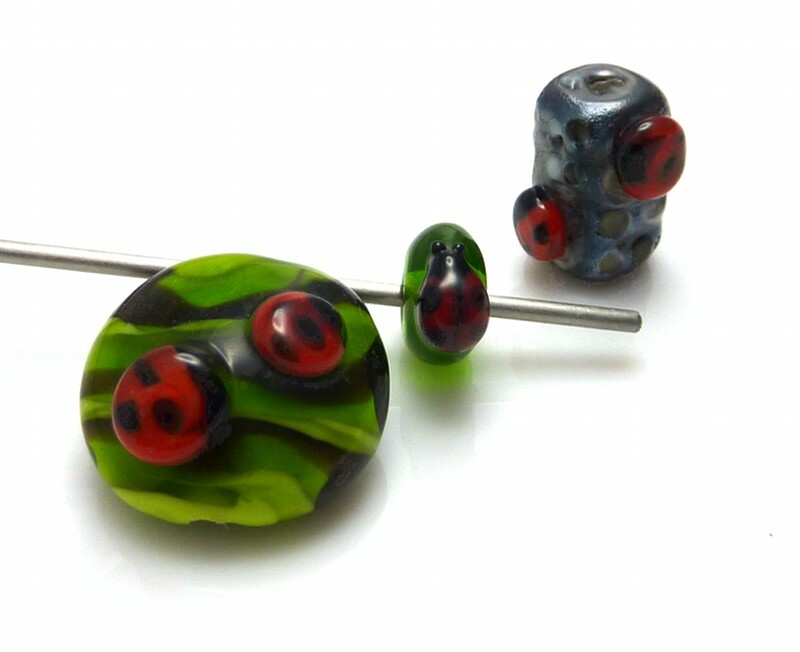 A ladybird bead: I made a core of lime green, added bome very fine black stringer lines and mostly encased it in dark grass green. 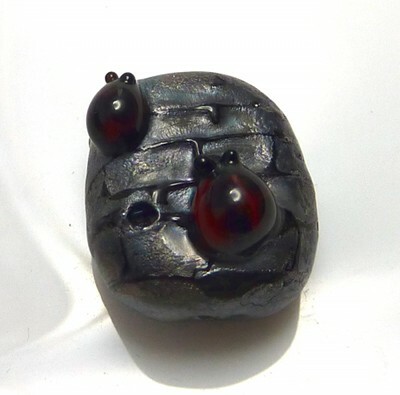 Then I added my ladybird murrini, capped with clear and patted in a bit. (There’s one on the back I melted in flat and didn’t cap. It didn’t come out well). 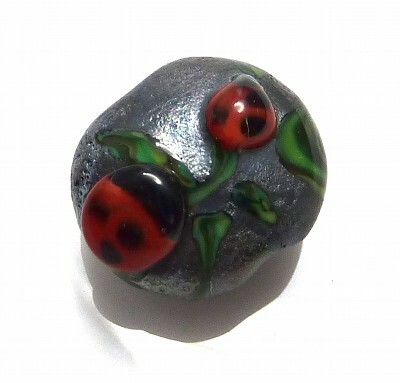 Then there’s a 3D ladybird I made in situ on a base of dark grass green. 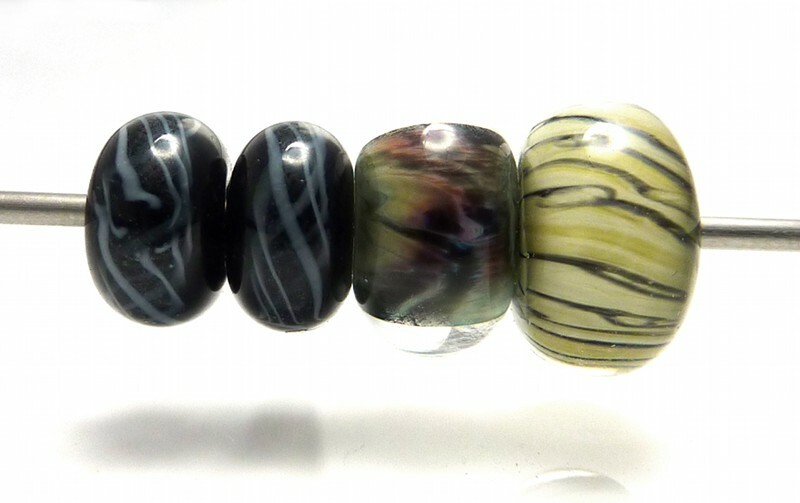 Finally there’s the METAtropolis bead take 1, with a P&T black oblong, white and mid amber dots and ladybird murrini. Teal and CiM kryptonite lentil, with a twisted line of SIS around the centre and complex green murrini. METAtropolis bead take 2. P&T black tab shape, fine clear stringer for the brickwork and two handmade ladybirds. (P&T black will stay black under transparents). P&T black lentil with vine cane and ladybird murrini that have been capped with clear. Dark lavender and CiM kryptonite lentil, with SIS swirl and Jolene’s purple murrini. Dark lavender is a lovely colour, though it colour changes to blue under incandescent light (as here). A sandy, beachy lentil. Ivory, silver foil and Jolene’s orange murrini. Reichenbach caramel and flamingo testing. I did these because Melanie of MindMelt did some colour testing of flamingo, and her description of the rods she had sounded a lot more like the caramel I had. Since I had a rod of each, I thought I’d compare them. 1. 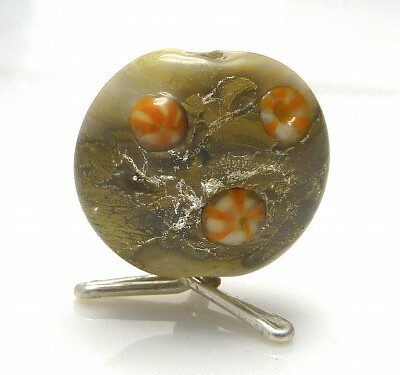 Clear lentil part encased in copper green, with flamingo trails. The copper green reduced a fair amount. 2. Caramel round (did this previously). 4. Flamingo reduced – both these go metallic. 5. Copper green on caramel. 6. Copper green on flamingo. 7. Silver foil on caramel. 8. Silver foil on flamingo. 9. 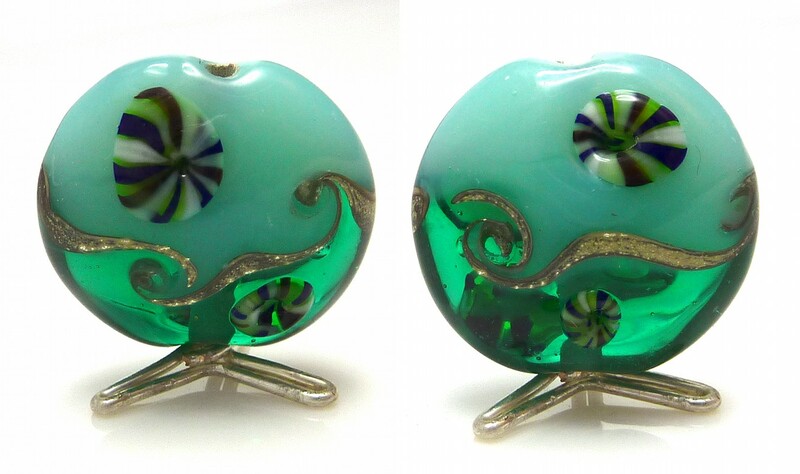 Clear, encased in copper green, caramel on left, flamingo on right. I didn’t get such impressive results as Melanie, and the colours on top of copper green didn’t get the outlines hers did, but I have an idea why not. It has happened before for me that colours you would expect to get large reaction lines with (and which do when they are rounds) don’t do it nearly so much when I press them as lentils. I am suspecting that when I add the surface decoration to the lentil, the base isn’t getting hot enough for the glasses to react together properly. On the lentils here you can see some pitting on the top colour where the raised parts got too hot when I was melting them in, but they still haven’t properly sunk in to the base. Need to adjust my technique, I think. Possibly the copper green layer was also too thin in this case. Anyway, my results do show that caramel and flamingo react in exactly the same ways in these tests. Caramel is just always browner and flamingo is always pinker. 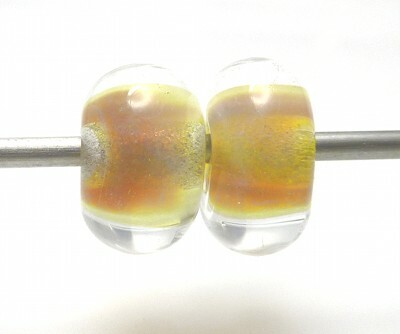 They both reduce to metallic like Reichenbach’s iris colours, and are very pretty doing so. Ivory lentil with orange twisties from Jolene wrapped around. Thermal shocked, so it has a crack down the centre. Reichenbach silver brown again: tiny cores and Laura Sparling’s thick encasing method. They’re better than my previous efforts, but I was still getting the inside too hot. In most of the small ones all that you see is the base colour I put it over. 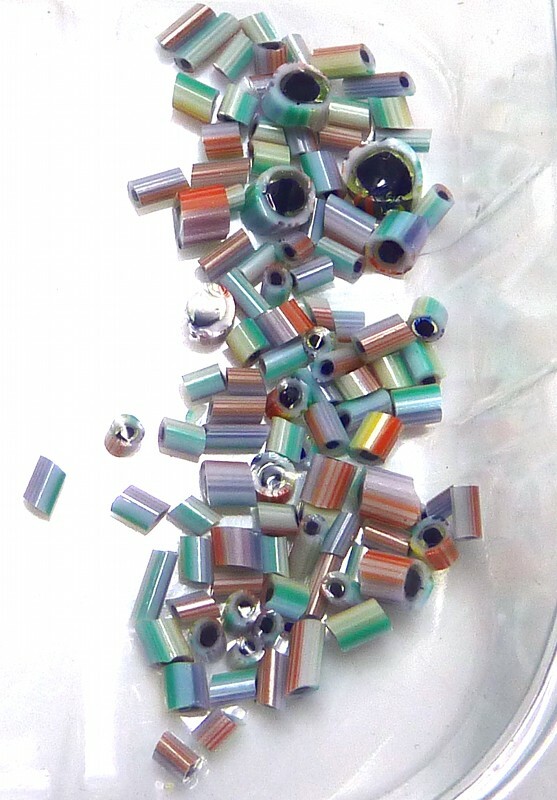 Here are the lentils where I got some colour – the smaller one is over cobalt, the larger over clear. 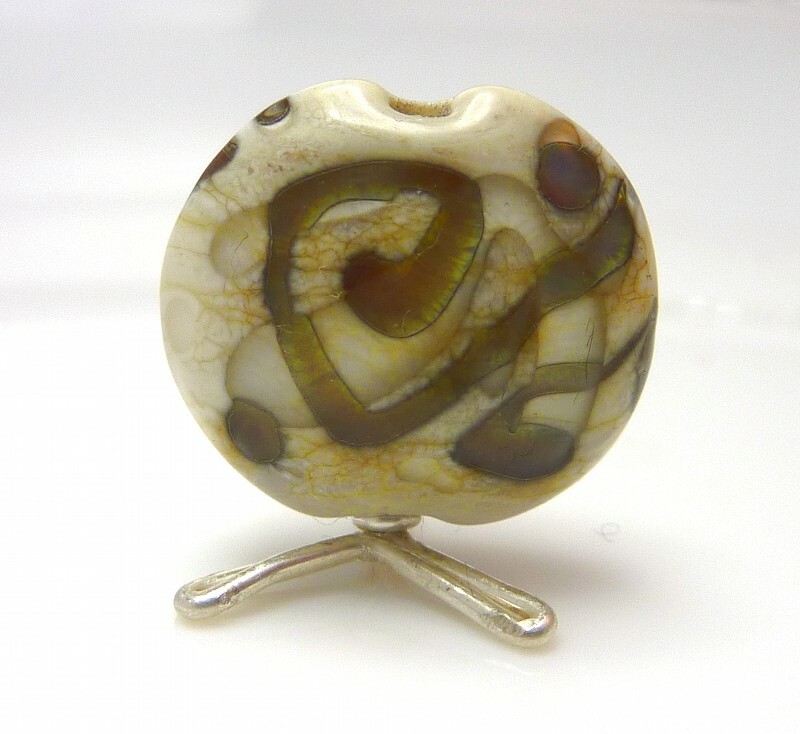 This is a dark ivory lentil with silver brown stringer on top, reduced, and random trails of clear on top. My glass nippers arrived at this point, so I could start using my murrini. 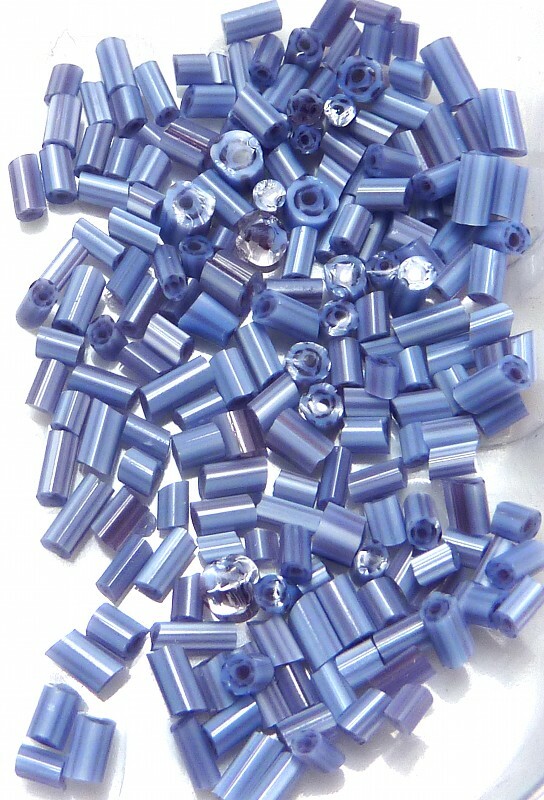 Bicone: clear in the centre, dark ivory one end, dark turquoise the other, capped ends with clear. I raked one side over to the other with a silver brown stringer and added a dot at the end, then added some of my green murrini. 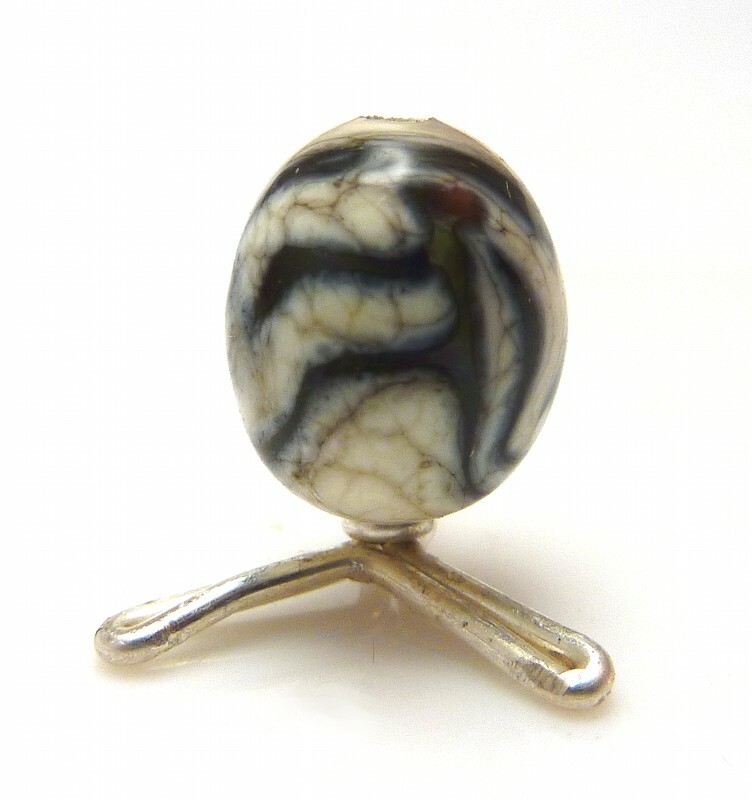 Dark ivory lentil with silver brown swirled trails. One each of my current murrini on each side (black and white, coral and lime, green). Also a large dot of silver brown reduced and covered with clear, and some smaller dots. Petrol green encased in clear lentil. Some SIS and the coral and lime murrini. Dark ivory base, raked silver brown stringer and reduced. It was shaped into an oval with Magdalena Ruiz multitool, which I found a bit tricky. Need to practise using that a bit more! It needs a 1.6mm mandrel and I’ve been using 2mm exclusively recently. 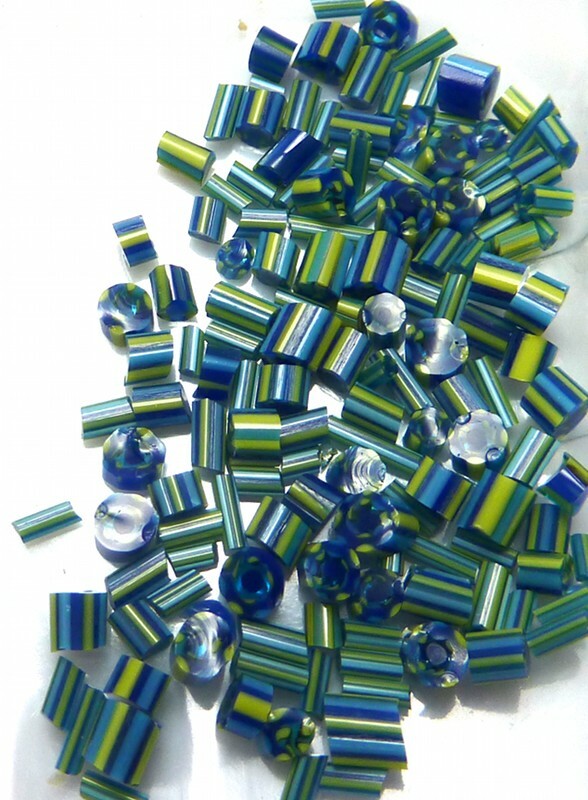 Murrini in CiM french blue, dark turquoise transparent, dark turquoise and daffodil yellow. The yellow appears as greenish. 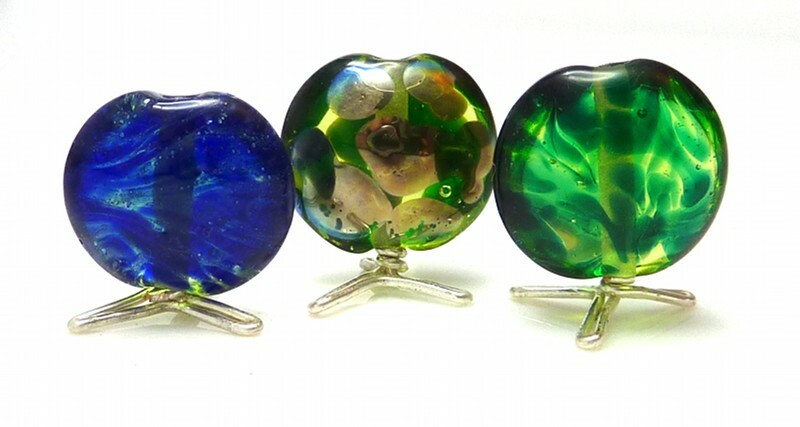 These three are all reactive frit on a base of uranium yellow. 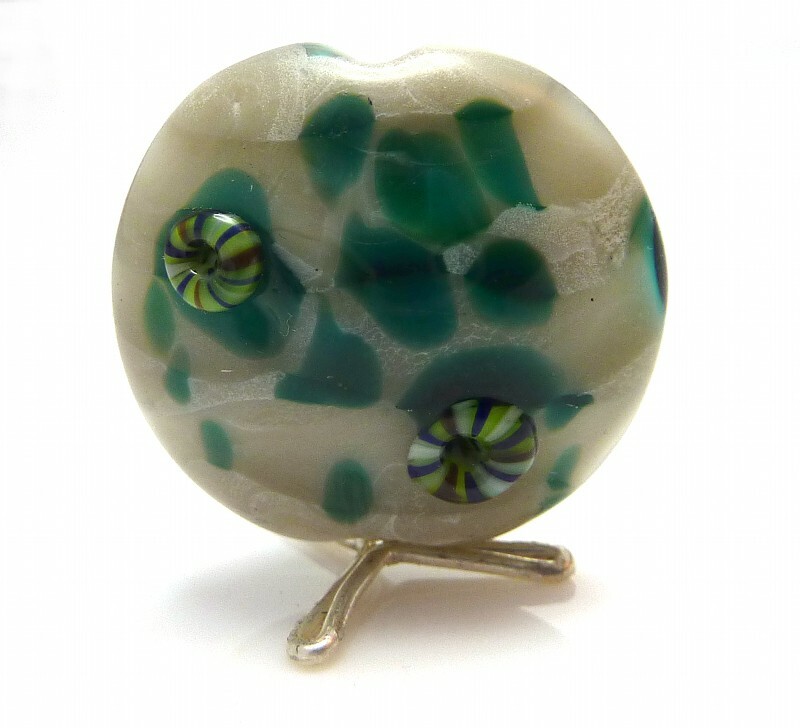 There is Gaffer silver blue lustre frit, Reichenbach iris green (the coppery one) and Kugler silver green. They were all reduced, though the iris green’s the only one that has much visible effect. 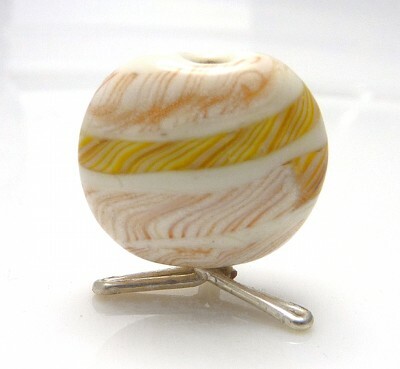 Murrini in red, yellow and white. 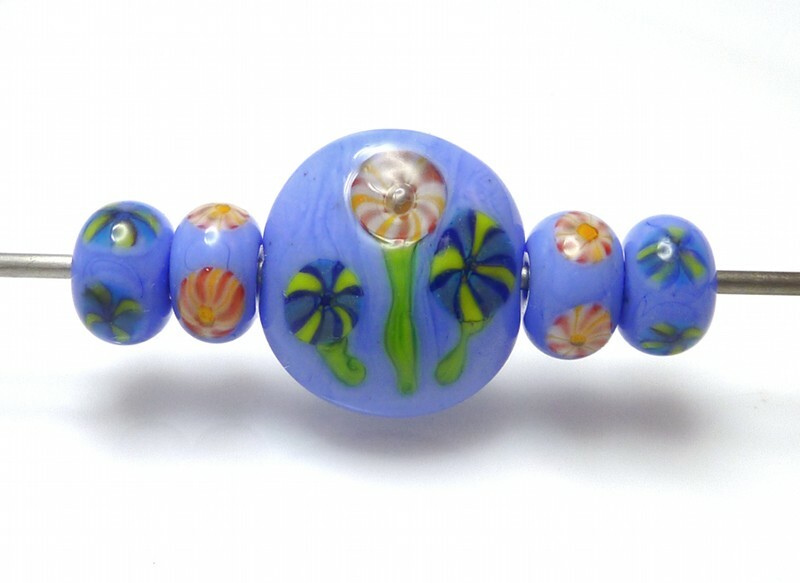 Periwinkle set with blue-green and red-yellow murrini flowers. 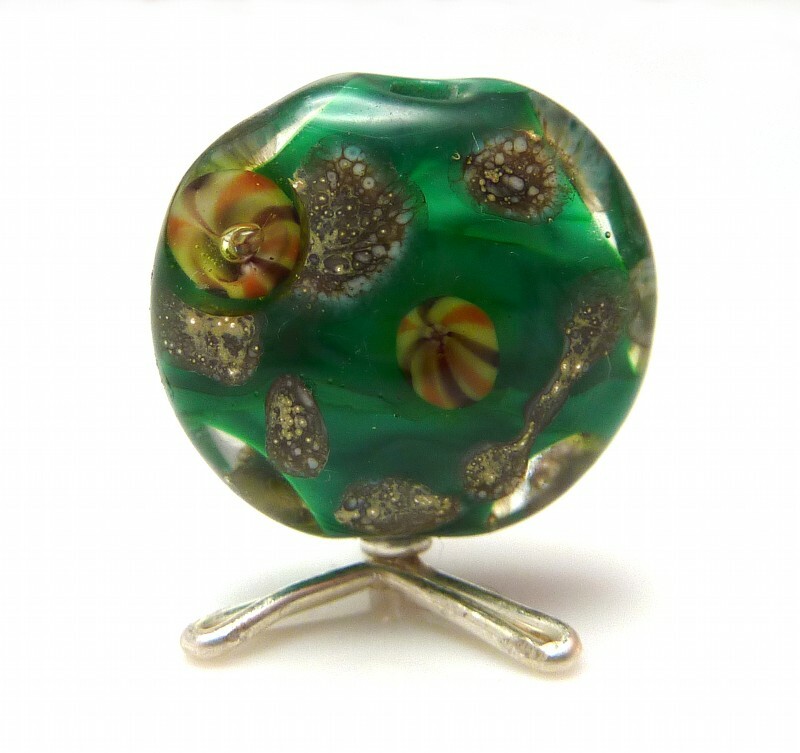 Vetrofond med lapis lentil with silver green frit, reduced. 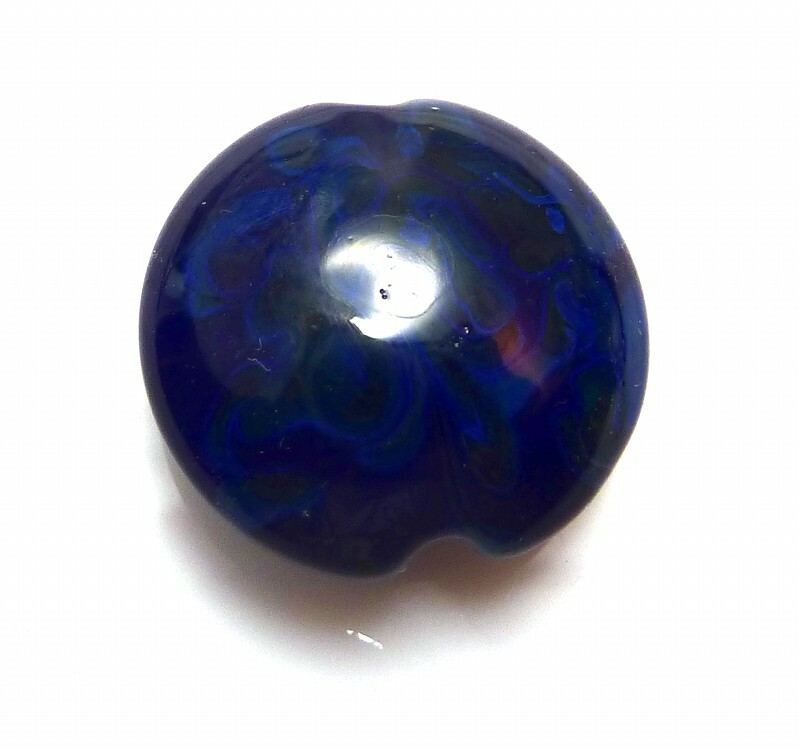 The effect is rather subtle, but it’s a beautiful deep blue with variations from the frit. 1. Gravity swirled CiM dirty martini on adamantium. 2. Reichenbach mystic grey-blue lentil with complex green murrini. 3-5. 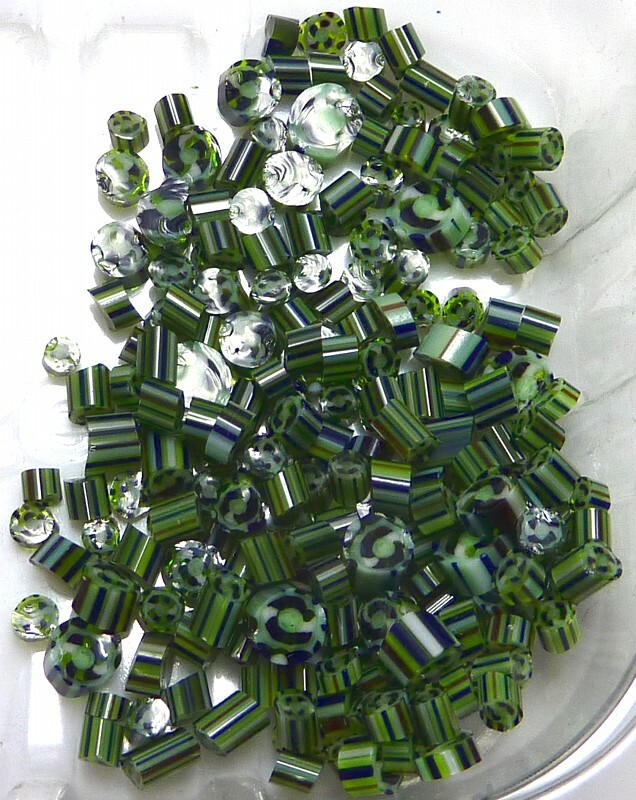 Reichenbach magic rounds with complex green murrini. Matching lentil that also has coral in it. 6. 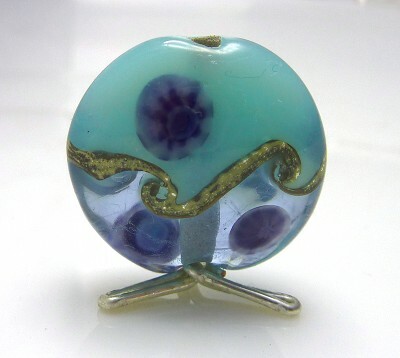 Vetrofond med lapis round, encased in clear, then vine cane added. Mostly encased again and periwinkle murrini put on top. I balanced the shape back to round by adding a few more dots of clear here and there and melting them in. Kitties! The smaller one is pearl grey with light grey spots, the larger is Reichenbach magic with black dots, a little light pink nose and whiskers. Rainbow murrini. After all the ones I’ve been making that have extra stripes and things in the middle, I decided to do some very simple ones that just have more colours round the edge. A couple are transparents, next time I’ll stick to opaques. More critters! 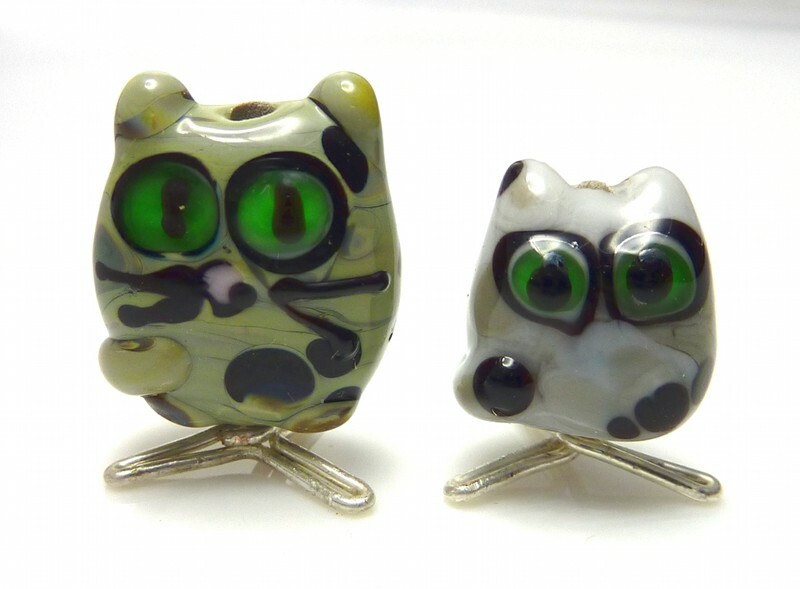 The owl is Reichenbach multicolour dark. Its eyes were meant to be amber but it turned out my stringer was striking orange instead, so they went red. 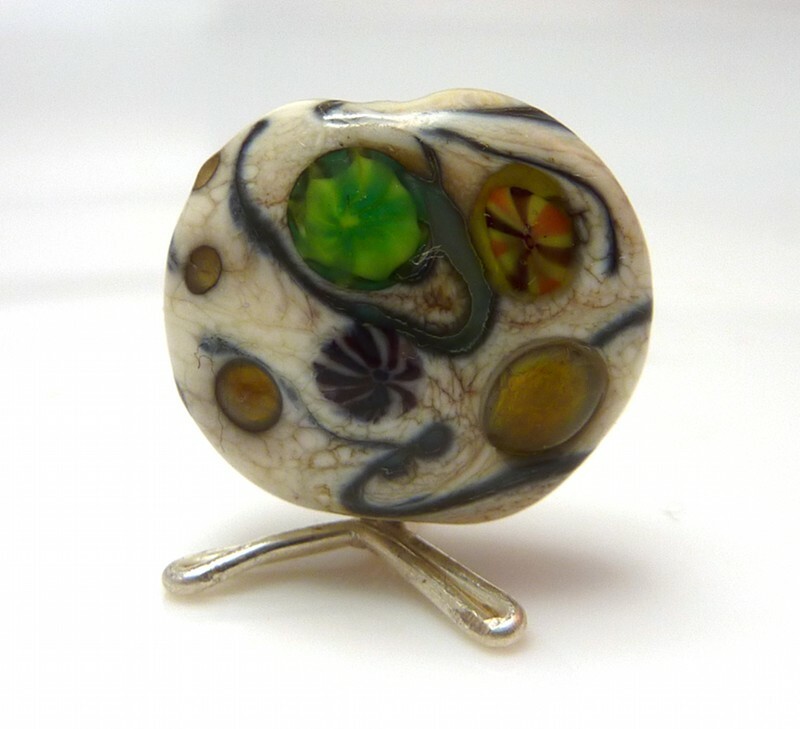 Then there’s a cow bead from Emma Green’s tutorial. 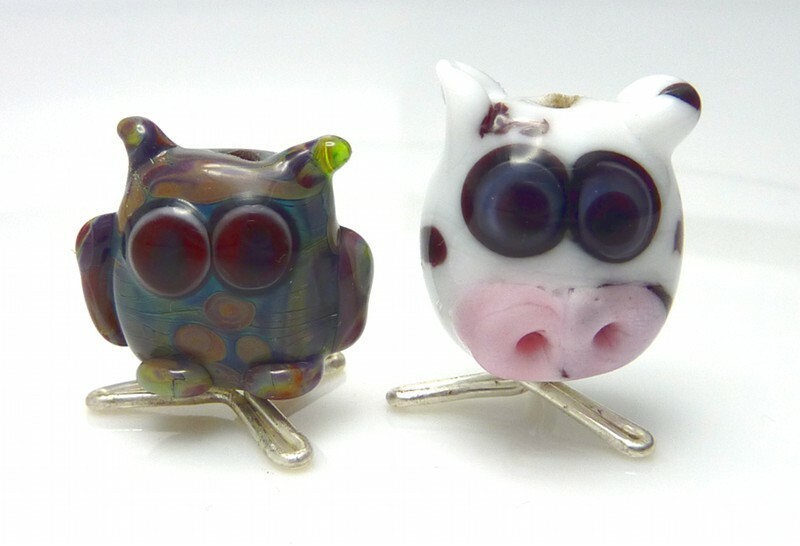 An owl and a cow! 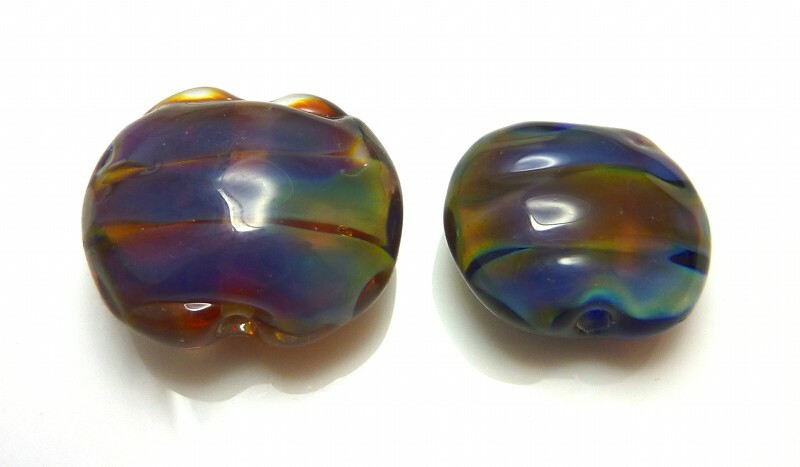 These are Reichenbach ocean with my rainbow murrini. I plunged and dotted the ones on the lentil with clear, and they look a bit like jellyfish! I used some of the teeniest ones on the rounds, poked the centres and left them part raised. 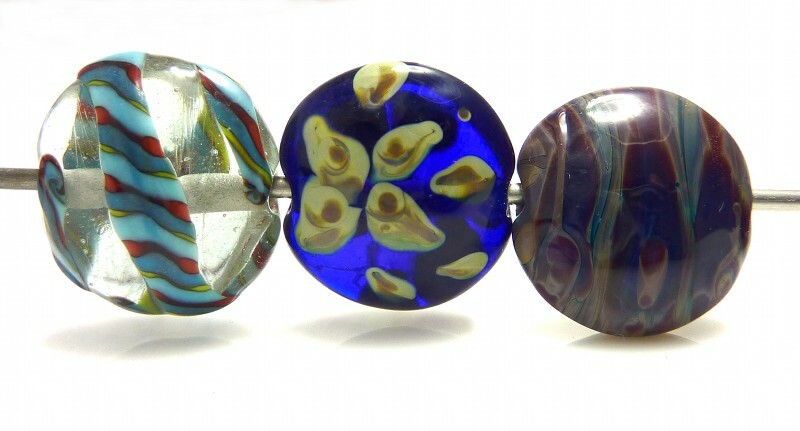 Three lentils: one of Reichenbach antique green with a red, turquoise, yellow and dark turquoise twistie on it. 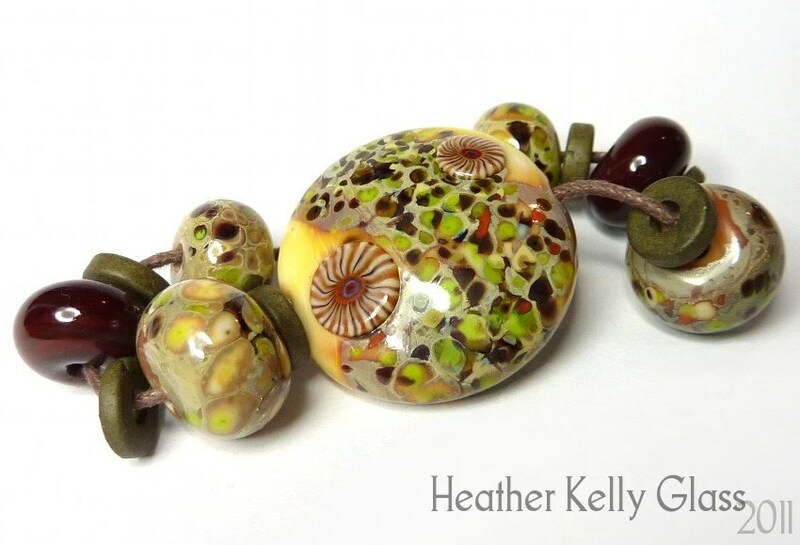 (Antique green’s a bit like very very diluted goldstone – it has little shimmers in it). Then a rather unsuccessful attempt to strike magic on top of cobalt blue, and finally a lentil of multicolour dark.